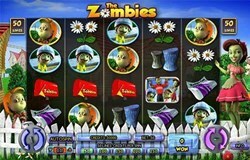 The Zombies is a blockbuster-sized slot game recently released by the casino game provider Amaya. While these walking dead characters have long been associated with blood and gore, Amaya has instead twisted the theme much further into a cute and humorous parody with zombies. Ideally, the game is based on those typical 1950’s suburban families turned zombie (with dad, mom and kids) who later interact with a bunch of uncivilized zombies as you will find out. Apart from two different gameplay modes, The Zombie comes with 50 paylines spread across 5 reels. 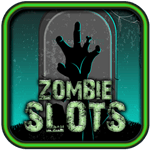 With The Zombies slot game, you can either play online or download a casino app to your mobile device. The slot basically comes with two versions and spin buttons which is a new feature from Amaya which is called the Pick-a-Spin feature. You are given the option to choose what risk is worth taking in the game, and moreover will determine how much you might to win during these free spin features. Now basically if you want to get wins that exceed your total bet, then the power mode might be the best gameplay to go for. This slot allows you to choose coin values starting at a penny maxing-out at a dollar. That means if you place 5 credits on each line, you stand a chance of getting a possible bet value of 250 credits. This slot game plays for free anyway, so free free to pile on the fun play credits to see what potential for winning can show up later. The Zombies pays in two ways depending on the mode you choose: from right to left and vice versa. The Power Game allows you to play with Zombie dad and son while the Easy Game features Zombie mum and her daughter playing. Each mode offers unique symbols to players but the values are nonetheless the same. Free spins and bonuses come in plenty with the comical Zombie dance parties. When 3 or more come together in dance party symbols, you'll be awarded 10 free spins with different multipliers. When bad zombies attack the kind family in the bonus game, by two or more parent symbols and Zombie symbol, you're allowed to select the weapon to use against them. You are given 3 attempts to kill as many of the bad zombies as possible for a chance of getting higher multipliers in the free spins video slot. As you already know, all prize pay-outs depend on the playing mode chosen and the winning combos you can be awarded. But generally, the male and female zombies top the pay chart with 500 coins for each as the jackpot offered. The two trash cans (one upright and the other spilled) are valued at 400 coins after that. You can also take advantage of the two different versions of newspapers, zombie children and mailboxs for increased payouts overall. You can enjoy playing The Zombies slot game online without downloading or registering. You want to play from your smartphone? It’s easy for you to play this no download instant play slot from Amaya just as easy. The Zombies provides great adventure, entertainment and greater payouts for those who want to win big prizes. And best of all it’s totally free to play anytime you want, so play today!